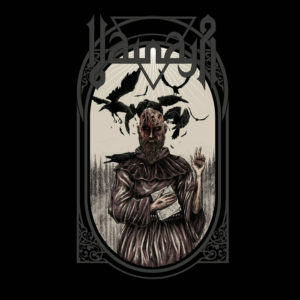 There are good reasons Finland’s Vainaja made it onto this site’s end-year list for 2014 with their debut album, Kadotetut; the music was at once despairingly oppressive and heavy hitting along with generally being some of the best doom of that year. The songs were memorable for their crushing style of death-doom that left little in the way of breathing room; the tempo alternated between a plodding giant and a furious boil but the sonic weight of the music never let up for the duration of the record. Now, the mysterious trio are cloaking themselves once again in a mist of meta-fictional folklore and offering an outing of cult-flavored metal in the shape of Verenvalaja, a solid if not especially forward moving album of engaging death and doom. The fundamental sound and style has not changed here on the band’s sophomore release, that much is clear from the chokingly heavy and dense atmospheres in songs like ‘Sielu’ and ‘Usva’. Frontman Wilhelm’s vocals are gravelly gutturals that sound like they’re emanating from a catacomb and the guitars are thick enough to be physically tangible without sacrificing tone. The band once again utilizes effective use of dynamics to give the songs punch; they are all given the opportunity to vary themselves between ominous melodic luls and gut-rattling avalanches of death dirges. Nothing is overdone, whether it is a portentously tranquil interlude of organ tones or a flat-out pummeling of furious chord crunching and drumming; each is employed just frequently and emphatically enough to give the other the fullest impact possible in terms of dynamic songwriting. Probably the most noteworthy song on the record is found on the later half with ‘Kultti’, largely because it is also the most subtle and varied (if subtle can indeed be an adjective directed towards this group). Individual guitar notes are plucked along in a hauntingly meandering melody while a short keyboard section towards the middle adds a nicely psychedelic flavor to the mix before the song builds back into the pummeling juggernaut sound that defines the album’s sound. 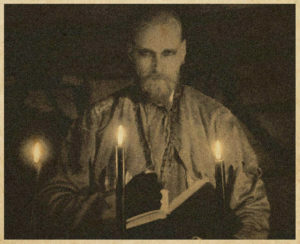 Thankfully there are enough of these unique flavorings dispersed throughout the record to keep the overall listen engaging; the long section of creepy drones and voices at the end of ‘Valaja’ adds both atmosphere and breathing room, while the sparse use of haunting clean vocal melodies on songs like opener ‘Risti’ help add a uniquely unsettling element to the sonic canvas. That canvas being a great sounding one at that; the guitars are either dolefully languid or menacingly overdriven, the bass is a mixed as a tangible and solid foundation, the drums thunder and punch through with great effect, and the vocals have a disconcerting presence without being overbearing. Obviously this review has mentioned tone and sound frequently, and that’s largely due to one of the most respectable aspects of the record: the production. On paper, this type of music is destined to be a drowned-out wash of low-end and distortion but thanks to a mindful engineering and mixing job Verenvalaja sounds fully alive and articulate even during its most crushing moments. Every chord, growl, and drum hit is articulated through the mix and never sound washed-out or compressed. And speaking of compression, there seems to be very little of it; the more subtle parts of the record are not leveled up for the sake of equitable loudness across the songs, and even the heaviest parts retain a refreshingly wide dynamic range. In a respectable turn the band even offer their vinyl mix digitally by way of a 24 High Dynamic Range download (mastered by none other than the great Dan Swanö), which is something more bands should take note of. It’s true that Verenvalaja isn’t pushing any new boundaries for the band; the album is directly on par with the previous one in terms of style and quality, though it does certainly have its own identity. The songs are slightly more varied this time around, and there are a few new elements that keep the experience from one record to another interesting. But if Vainaja are maintaining a sound, they are maintaining a damn fine one, one that will crush just about anything else out there in terms of overpowering weight and bleak devastation. This album is one of pure, heavy-handed doom and it wields its deathhammer with a well-aimed but merciless ease. Conclusion: Verenvalaja is a crushing and foreboding death-doom album from one of the genre’s undeniable forerunners.